Tsavorite garnets are shiny green young gemstones with a reasonably long geological history. They were first discovered in 1967 by a British geologist named Campbell R. Bridges in the north-east of Tanzania Mountains. Bridges came across strange bumps of rock and inside these objects were found to be some green grains and crystal fragments. Once gemmological examinations had been done on the rock, Bridge realised that he had discovered a green grossularite, which is a known mineral belonging to the garnet gemstone group. 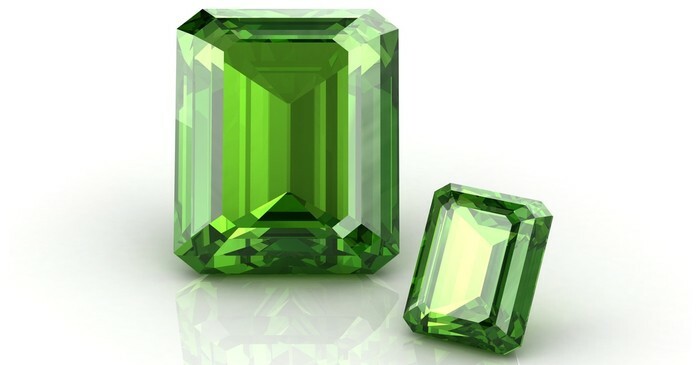 Tsavorite garnets are beautiful bright green coloured gems with such clear transparency. After its discovery companies like Tiffany & Co in New York became interested in the gemstones. However at the time it was very difficult to extract the stones in Tanzania as their government did not approve of them extracting the gemstone. Assuming that the gemstones were part of a larger geological structure which possibly extended all the way to Kenya, Bridges began exploring in that nation. Bridges became successful in 1971, when he found a variety of minerals and was granted permission to mine in that area. The gem was originally only known to mineral specialists until 1974 at which point Tiffany & Co. launched a marketing campaign that brought attention and recognition of the stone. Bridges died in 2009 after he was attacked in their property in Tsavo East National Park, it was thought that this attack was over a three year dispute over the access and control of Bridges’ gemstone mines. The name tsavorite was suggested by Tiffany & Co.’s president Sir Henry Platt in respect of the Tsavo East National Park in Kenya. Tsavorite garnets were also present in Toliara Province, Madagascar and small deposits of the material have been found in Pakistan and Queen Maud Land, Antarctica. In late 2006 a 925 carat tsavorite crystal was found and yielded an oval mixed-cut 325 carat stone which is one of the largest, if not the largest, tsavorite garnet gem in the world.